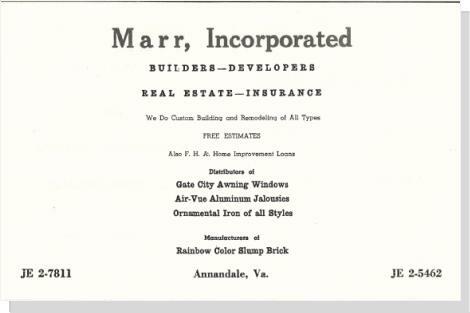 Instead, it is possible that the road was named for a local resident whose company, Marr, Incorporated, was in the building, developing, and real estate business. Let’s be clear, this is proposed as the origin of the name, not yet a confirmed fact. If you examine the names of builders and large property owners in Annandale’s modern age (beginning 1950’s), you will notice a pattern of streets being named for them, their children, and sometimes their parents. (**See a list below.) This is not a practice exclusive to Annandale. Indeed, many communities trace the names of streets, parks, creeks, meadows, and any gathering spot to the name of the first known owner or developer. It is quite possible that Annandale's John Marr Drive, created when the K-mart property was developed in the 1970's, was named for this builder/developer rather than for a civil war soldier who had NO known association with Annandale. If anyone has definitive information regarding this subject, please email info@annandalechamber.com and place JOHN MARR in the subject line. We look forward to hearing from you. Stay tuned for a history story that will appear in the July 2019 ENDEAVOR News Magazine. This story will debunk the greatest fabrication of poorly researched and printed Annandale History we have encountered.